Mighty No. 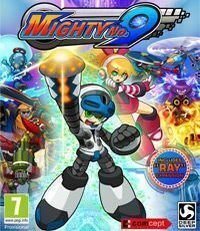 9 is an arcade platformer developed in 2.5D by the experienced Japanese developer Comcept; the title draws inspiration from the renowned Mega Man series. Mighty No. 9 is an arcade platformer which draws inspiration form the renowned Mega Man series. The Comcept studio, led by the legendary Japanese creator – Keiji Inafune, a long-time employee of the Capcom company, is responsible for developing the production. The storyline revolves around the mighty Beck, the only robot who managed to resist an extremely dangerous virus, which provokes aggression in mechanical creatures. It is our hero’s task to eliminate the threat and save the world. The gameplay shows significant similarities to classic video games from the era of 8 and 16 bit devices. Mighty No. 9 offers numerous platformer elements, which require us to skillfully control our character while running, jumping through consecutive ledges, and using the hero’s powers in combat. During skirmishes, we are aided by an additional character, which appears for a few seconds in the most dangerous situations. In addition to the single player mode, the title features a challenge mode and allows us to cooperate with other users via the Internet. In both cases, the player takes part in a special operation, whose level is based on the single player campaign missions; however, the first option is meant exclusively for a single user, whilst in the co-op mode the players can play the roles of Beck and Call, and vanquish their enemies together. Mighty No. 9 has been developed using the Unreal Engine technology, known for powering many renowned productions, such as: Mass Effect, BioShock Infinite as well as the Gears of War series. The engine provides the title with excellent visuals, while allowing the developers to preserve their own, unique style. The game was funded by a Kickstarter campaign, the project managed to collect the necessary funds within several dozen hours after launch.